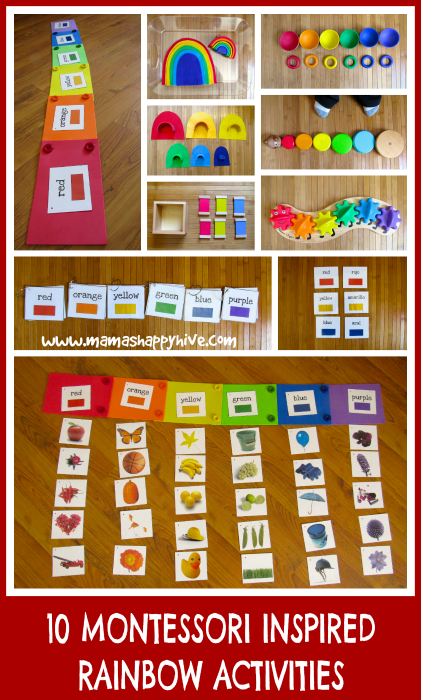 I have been gathering materials for our Montessori Inspired Toddler Rainbow shelves for awhile and waiting for the right opportunity to introduce all these gorgeous color activities to Little Bee. Although, he has already been exposed to all the colors by playing with various rainbow toys and talking about the colors all around us in our environment. I enjoy telling Little Bee about the white clouds in the blue sky, the green trees, and brown dirt on the ground. We also talk about the yellow school bus and red firetruck. These are just a few of the examples of how I have already introduced colors to Little Bee. 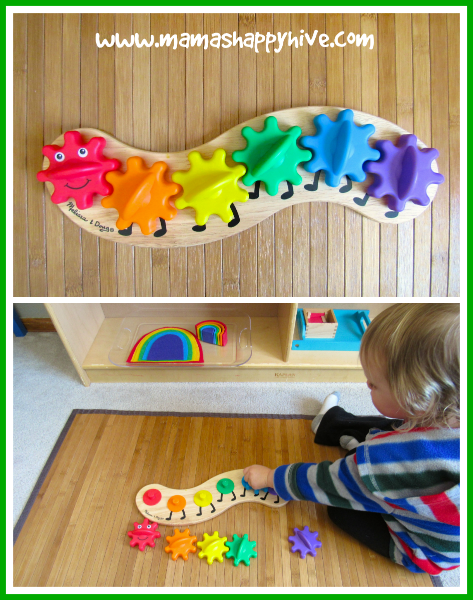 I put these shelves together to help Little Bee learn the sequence of the rainbow colors, become familiar with the names of the colors (sight words), and other activities for fine motor development. 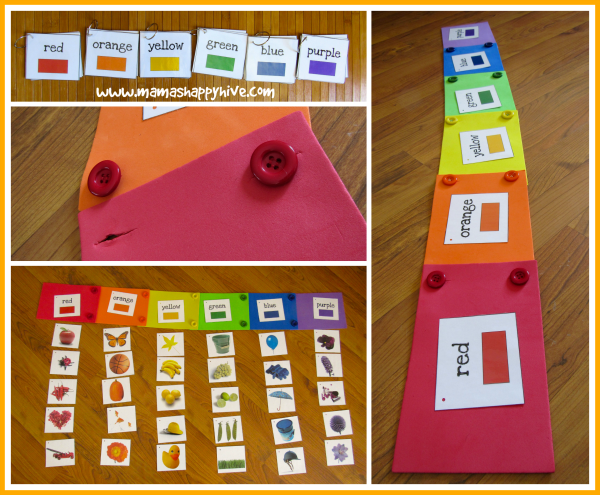 These materials work well for a toddler (2-3 years) and some materials can be used for a preschool aged child as well. The activities in this post work really well using the 3 period lesson. Here is a YouTube video on the Montessori 3 period lesson and one more video by Info Montessori Sensorial 3 period lesson. I want to point out that it is important to present the materials to your child from left to right in preparation for reading from left to right. It's also important to only advance to the next part of the lesson if your child is developmentally ready for that next step. If the child is not grasping a concept, then only present the first period. If the child shows no interest in the material, then put the material away until a later time. The following photo collage is actually four different activities that can be presented to the child one at a time. After mastering each activity, the materials can all be combined together for a matching game. First of all, I gave Little Bee six small color books. I presented them to him in order on the mat, from left to right, while saying the name of each color - red, orange, yellow, green, blue, and purple. I let him explore each book on his own. Next I laid out the rainbow foam pieces, buttoned together in order from left to right. We then placed each color book on top of the matching foam piece in order from left to right. I showed Little Bee how to match the colors and again repeated the name of each color. After that we took each little book apart and laid out the colored pictures in order under their color title. The free color printables can be found at - Preschool Colors and Shapes. I introduced this Melissa & Doug Caterpillar Gear puzzle to Little Bee when he was about 18 months old, but he didn't seem to really understand it. So I put it away and presented it to him on his rainbow shelves at 2 years old. He has mastered this puzzle by placing the correct color on the matching colored peg. He also loves to watch the gears spin simultaneously as he twirls them with his fingers. 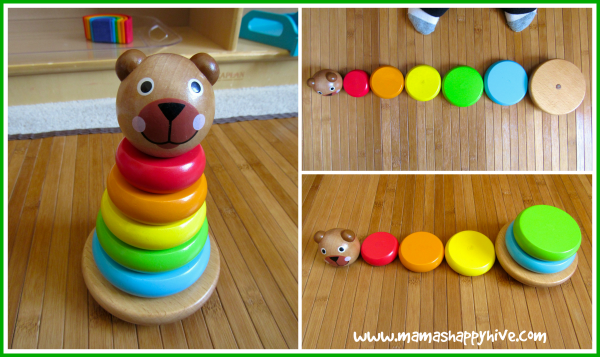 I love this Manhattan Toy Brilliant Bear Magnetic Stack-Up because the pieces lightly snap together with magnets and the colors are presented in the order of the rainbow from smallest piece to largest piece (minus purple.) I made a point to present the stacking bear to Little Bee the same way with each presentation using the 3 period lesson. I placed the stacked bear on the mat and then took the bear head and placed it at the farthest left side. I then dismantled the bear in order from left to right as pictured below. After that, I showed Little Bee how to stack the bear from the largest piece to the smallest, while moving the base closer to the next piece needing to be stacked as pictured below. Little Bee is still learning how to stack the bear from largest to smallest, so I have not progressed to the second period yet because he is not yet ready. This is another fun matching exercise to help develop pre-literacy skills. I purchased these handmade rainbow bowls and rings from a Facebook group called, Montessori Material for Sale. 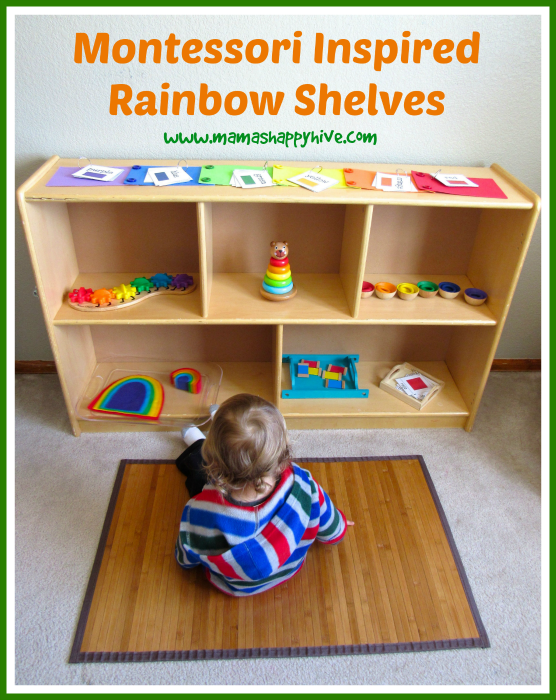 This activity is Little Bee's favorite material on our rainbow shelves. Again, I used the 3 period lesson while presenting these bowls and rings to Little Bee starting with the red bowl and ring. I would say, "Here is the red bowl." Then I placed the ring right below the bowl and said, "Here is the red ring." 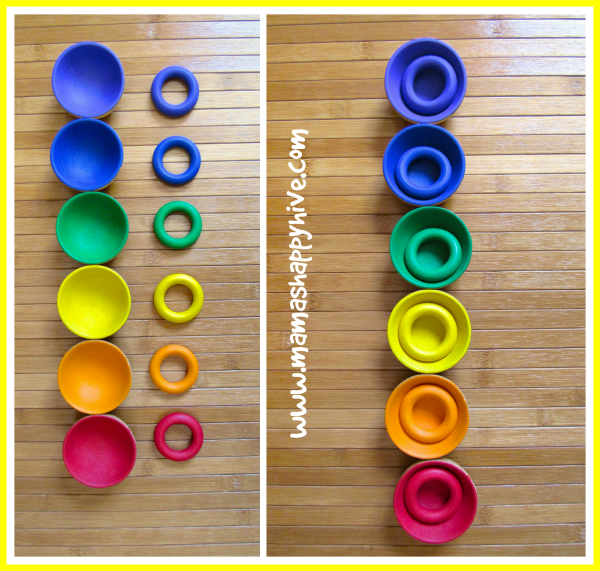 I presented each bowl and ring this way in order of the rainbow colors (left to right). After that, I used the same words and placed the ring inside each bowl in order. Little Bee found this presentation of the bowls amusing and rearranged them to his liking. 😉 I love how toddler brains work! I love how this activity turned out and I am actually very surprised at how many lovely tactile manipulations can be created with these materials. I bought the small Grimm's Rainbow Stacker from Amazon several months ago and I always knew when I finally put these rainbow shelves together that I would use them. 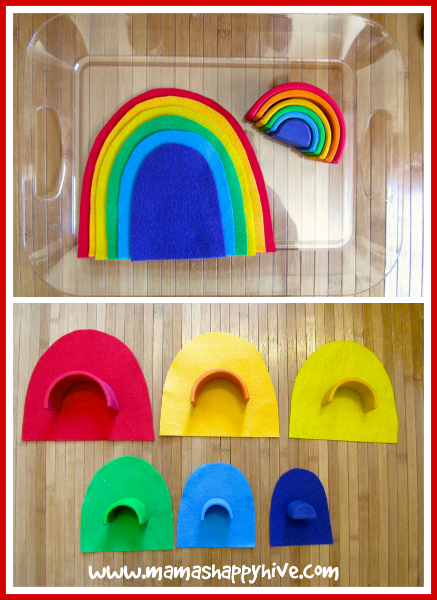 I found the idea for the cut-out felt rainbow on Pinterest and on the Cake in the Morn Esty shop. However, I cut out my own rainbow from felt in less than 5 minutes for this activity. I actually didn't think to combine them on a tray until after I cut the felt rainbow. These two materials work beautifully together while using the 3 period lesson. I presented each rainbow separately to Little Bee. First I presented the felt rainbow by laying each piece in order from left to right on the work mat. Then I showed Little Bee how to stack the felt rainbow back again. I emphasized the name of each color and that the red felt is the largest piece, next orange, and so forth. I also pointed out to Little Bee how to place each felt rainbow piece on the flat line at the bottom of the curved shapes by tracing the line with my forefinger. This allows him to stack the felt pieces in an orderly fashion. I presented the Grimm's wooden stacking rainbow in a similar fashion. The red wooden arch is the largest piece, next orange, and so forth. I laid the pieces out in order from left to right while naming each color. Then I showed Little Bee how to stack them from largest to smallest. The next level of matching challenge is to lay out each felt piece of the rainbow and match the Grimm's wooden stacking rainbow to its corresponding color. 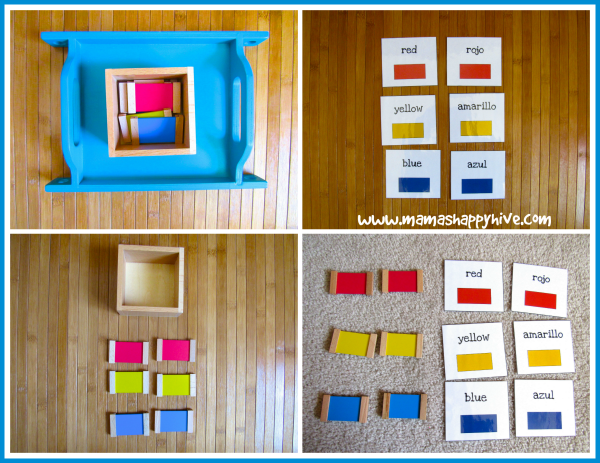 The Montessori color tablets (box one) are used to introduce the primary colors to a child. Each piece is laid down in order by holding the wooden side of the color tablet with a three-finger hold. This allows the child to fully see each color that is being presented and also demonstrates for him how to hold the color tablet. As I placed each tablet on the mat, I simply stated the name of the color. Then I showed Little Bee that each color tablet had a matching pair. This presentation completed lesson one of the 3 period lesson. Little Bee was not ready for lesson two yet, so we stopped at lesson one. I think he is capable of matching the color tablets, however, he didn't seem to take an interest in the color tablets at this time. The free Spanish/English color printables can be found at - Preschool Colors and Shapes. 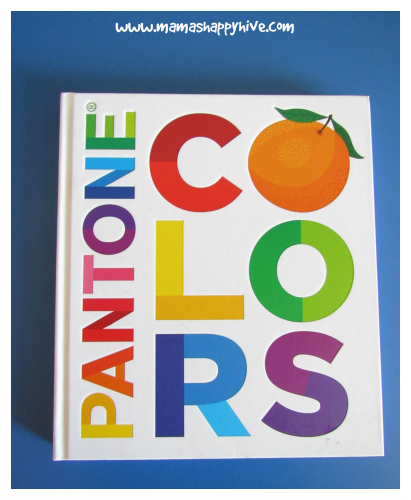 The Pantone Colors book is a lovely addition to your child's library with its vibrant colored pages and a nice presentation of the variation of each color. Another wonderful artistic approach to introducing colors are the Pantone Art Cards. I highly recommend these gorgeous cards as they were and continue to be some of Little Bee's favorite cards, especially when he was under a year old. You can visit a review on the color art cards here. Please PIN it for future reference. Thank you! Follow Vanessa @'s board Rainbow Unit Study on Pinterest. Thanks for your great blog post, Vanessa! It comes at the perfect time as I just started conquering colors with my little one. I really dig the color books you made. I can’t wait to use those printables! Many thanks for sharing! What beautiful toys and activities. How can one not be cheery after playing with them, too? Goodness! So amazed how you can come up with all these materials and wonderful presentation! Love how you introduce colours through a rainbow unit. I love it! And especially love the cups/bowls and rings!! What a great post! I just love this. We have really been solidifying my daughters color recognition and this gives me some great inspiration to be sure she isn’t having any issues! Thanks again! I am so in love with the foam rainbow puzzle. I’m adding that to my to do list. I just bought a huge pack of felt so I might make a fabric one. I love your felt rainbow idea too. Thanks for once again sharing your wonderful ideas. That colored gear toy is so cool. I see that holding interest for a long time! Can I also say that I love that you held back a toy because he didn’t seem interested in it? Love that! It can be so overwhelming having tons of toys and books around at all times. Thank you for putting this post together. thank you for showing such variety here. I am really drawn to the bowls and rings. I’ll have to make a set for our class!